I think everyone can agree that working out is so much easier and more fun when you have some great hits and music to listen to! 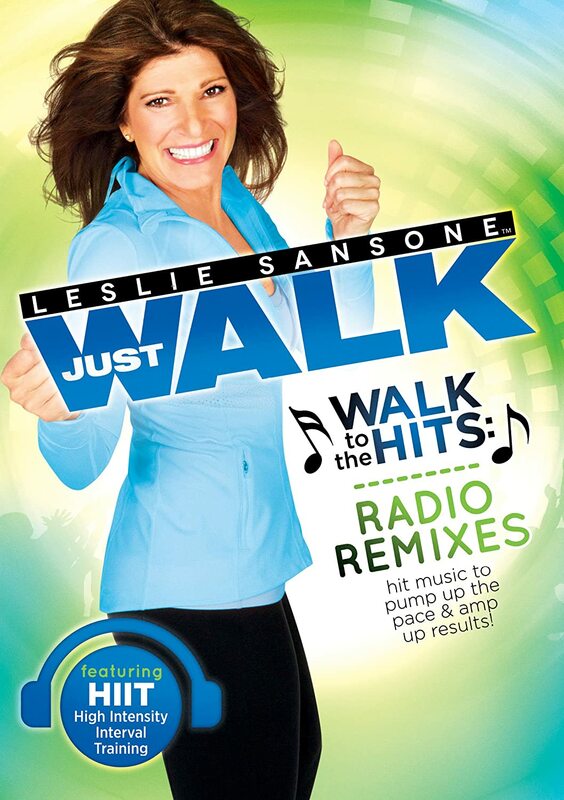 Well, in Leslie Sansone: Walk to the HITS Radio Remixes, it's a BIG Calorie Burning WALK CONCERT in your HOME! We've all heard it before. The most effective workout plan is the one you actually DO! But with all of the demands in everyones busy life, it's not so easy to find the time and energy to exercise. Motivation is key, and music is one of the best motivators. Great music makes your workout more fun and keeps you exercising because you LOOK FORWARD to it. That's why Leslie created WALK TO THE HITS. Walk To The Hits features hit music and High Intensity Interval Training (aka HIIT)-it's the perfect combination! Hit music pumps up your pace, and HIIT training alternates between short bursts of all out effort and longer periods of recovery, allowing you to walk a shorter session while blasting away as many calories as you would in a longer one. The high-energy gang of walkers, the music, the moves, the miles, the smiles .....It's more FUN than anyone should have on a fitness walk!